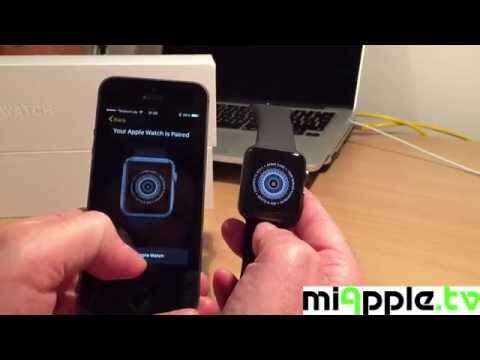 Learn how to set up an Apple Watch with your iPhone. To get started with your Apple Watch, pair and sync it with your iPhone. After waiting for some weeks, I’ve been the happy owner of an Apple Watch Sport with 42 mm Space Gray Aluminium Case and Black Sport Band (product number MJ3T2LL) since May 13, 2015. See the video of my very first set up of my Apple Watch Sport in Space Gray. Bonus: At the end of the video you will see how to change the band of an Apple Watch. If you want to see my very first unboxing video, have a look at the post “Unboxing Apple Watch Sport In Space Gray“. I’m using the Apple Watch Sport either in combination with an iPhone 6 in silver, 128 GB or with an iPhone 5S in space gray, 32 GB, without any issues. Note: You cannot pair an Apple Watch to multiple iPhones. If you want switch an Apple Watch to another iPhone, you have to unpair it from the first iPhone and pair and set it up with the new iPhone. For details see Apple’s support document “Unpair your Apple Watch and iPhone“, especially for making an Apple Watch backup. To use your Apple Watch, you’ll need to pair it with an iPhone 5 or later running iOS 8.2 or later. You can pair one Apple Watch to your iPhone at a time. And one iPhone to your Apple Watch. On your iPhone, go to ‘Settings‘ > ‘Bluetooth‘ and make sure Bluetooth is on. Make sure your iPhone is connected to Wi-Fi or a cellular network. Turn on your Apple Watch by pressing and holding the side button next to the Digital Crown until you see the Apple logo. Make sure both devices are charged, and keep them close together as you pair and sync them. Then tap a language on your Apple Watch. You can scroll through the list by rotating the Digital Crown or swiping the screen. Tap ‘Start Pairing‘ on your Apple Watch and again on your iPhone. A pairing animation should appear on your Apple Watch. Hold your iPhone over the pairing animation on your Apple Watch. Center the watch face in the onscreen viewfinder on your iPhone until a message says Your Apple Watch is Paired. Tap the info icon on your Apple Watch. Your device’s name should show up on the watch face. On your iPhone, tap the device name that matches the one you see on your Apple Watch display. A six-digit code will appear on your Apple Watch. Enter that code on your iPhone to pair the two devices. Then follow steps to Set Up. On your iPhone, tap Set Up as New. If you’ve set up once before, you can tap Restore from Backup on your iPhone and follow onscreen steps to get to the Wrist Preference screen. Pick a wrist by tapping Left or Right on your iPhone. Then read terms and conditions and tap Agree to continue. Enter your Apple ID password. You’ll need to sign in with your Apple ID password to enjoy features like Digital Touch, Apple Pay and Handoff. Your iPhone settings for Usage and Diagnostics, Location Services, and Siri will transfer to your Apple Watch, and the other way around. So if you change the settings of these services, those changes will apply to both of your devices. Tap Install All to sync iPhone apps that work with Apple Watch. Only apps that are compatible with Apple Watch will sync. Tap Choose Later to sync only basic information like Mail, Contacts, and Messages. Your iPhone and Apple Watch will begin to sync. The length of this process varies depending on the amount of data you’re syncing. Keep your devices close together until you hear a chime and feel a gentle tapping sensation from your Apple Watch. It is very simple to pair and set up an Apple Watch. I enjoyed the set up of my Apple Watch Sport in Space Gray. Now I’m testing my Apple Watch. More details are following! Do you have special questions for testing? Comment and I’ll have a look into it!